MOAB – Arches National Park has issued a release warning visitors to the park that access will be limited as the Devils Garden Loop Road and Trailhead will be closed June 16-26 to undergo completion of major renovation. Given recent record-breaking park visitation, the park’s release said, those entering Arches should expect parking to be limited and parking lots to be full, especially during the construction period. Parking regulations will be strictly enforced. The Devils Garden Loop Trailhead located at the end of the park’s 18-mile main road, is the access point for features such as Landscape Arch, Double O Arch, Dark Angel, and the Primitive Loop Trail. All trails from this location will be closed during this project. Visitors traveling the park road during this period will need to turn around at the Sand Dune Arch Trailhead parking lot. 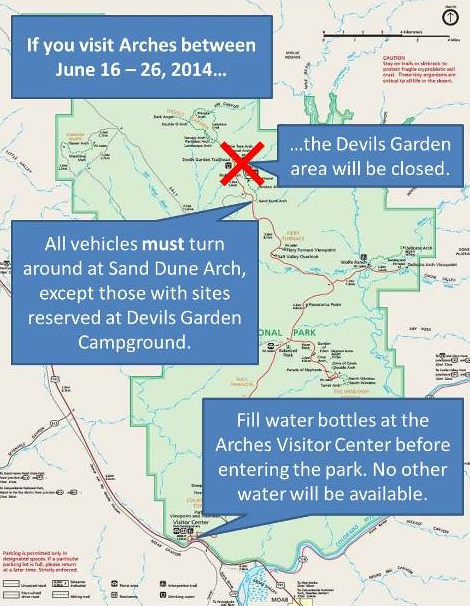 Water will not be available at Devils Garden Trailhead during construction, so visitors will need to fill water bottles at the Arches Visitor Center prior to driving into the park. The Devils Garden Campground will remain open only to campers with reservations. As part of the renovation, the park will re-align the road in order to create more efficient angled parking, and construct a dedicated tour bus and large RV parking area. Park officials recommend visitors avoid Arches National Park during this construction or visit the park prior to 9 a.m. or after 3 p.m.
“We appreciate everyone’s understanding and patience as we continue our efforts to protect park resources while improving park facilities for visitors,” superintendent, Kate Canon, said.